Chichicastenango sounds like a made up place for a town. It is the type of name that warrants a little jig each time I say it. Each time trying to perfect the pronunciation like preparing for a performing on stage. It is the type of name that brings a smile to the face each time it is spoken. While affectionately known as Chi chi, I prefer to pronounce the whole name, if only for my simple enjoyment. As I wind my way through Central America’s gringo trail with Allison we are noticing Guatemala is a tough country to get through. Not just due the infamous chicken buses but there is quite a lot to see and do. 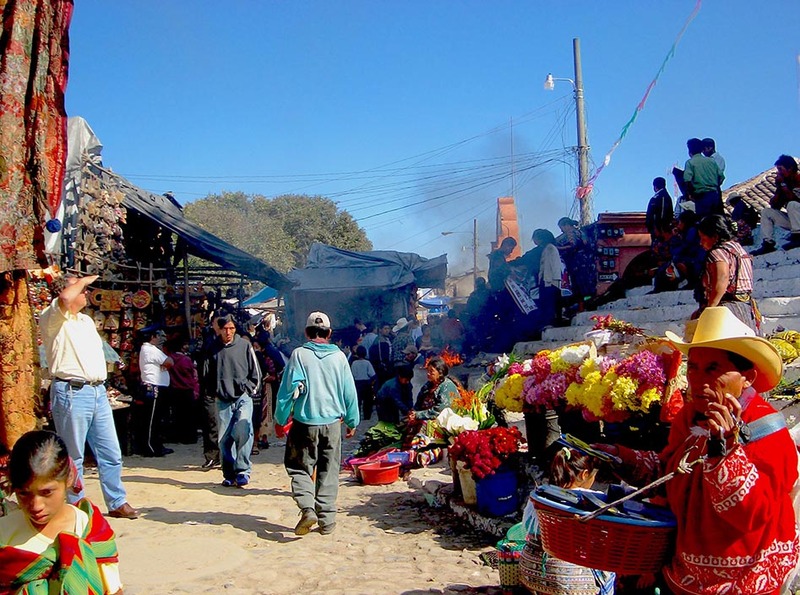 A simple visit to historic Antigua has us taking an overnight trip out to the weekly Chichicastenango markets to see the vibrant Guatemala culture in full swing. Out travel companions Martina, Sean and Juli make up the quintet. It is a two chicken bus route to Chichicastenango from Antigua. The first bus drops us in a dusty cross roads to be met by the bus to Chichicastenango which comes and leaves rather promptly. Our bags are loaded on the roof and we hop aboard just in time before it roars off down the highway. The swiftness to the arrival and departure can mean only one thing. The bus is full, very full. And it was. We squeeze into the aisle, there is standing room only in the hot and dusty bus. A few of our fellow passengers took to rifling through our pockets and bags like it was a formal greeting. Petty theft is rife aboard a crowded chicken bus! Martina’s bags zipper was at that point opened with all the contents spilling to the floor. After a good month’s travel on the chicken bus we were relatively content most valuables were in out of the way places. Of more concern at this moment was the white knuckle ride we were currently on. Our driver was living up to an alternate version of a chicken bus as he played chicken with just about everything on the road. It was a choice of hold onto our belongings to prevent them being fondled or hold onto a railing to prevent being tossed around. Thankfully we arrived safely in Chichicastenango by late afternoon. The market stalls were beginning to be set up. It was fascinating to watch the mass construction underway. Countless long, thin logs were bound and erected which were then covered with tarpaulins in what is a weekly routine. What surprised me the most was that the average age of the these stall builders was about 12. The youngest were scaling the thin poles to tie off the tarpaulins under the watchful eyes of their not much older brothers. They worked well in to the evening to have the stalls all done and have their parents bring in the merchandise the for the 6am market opening. 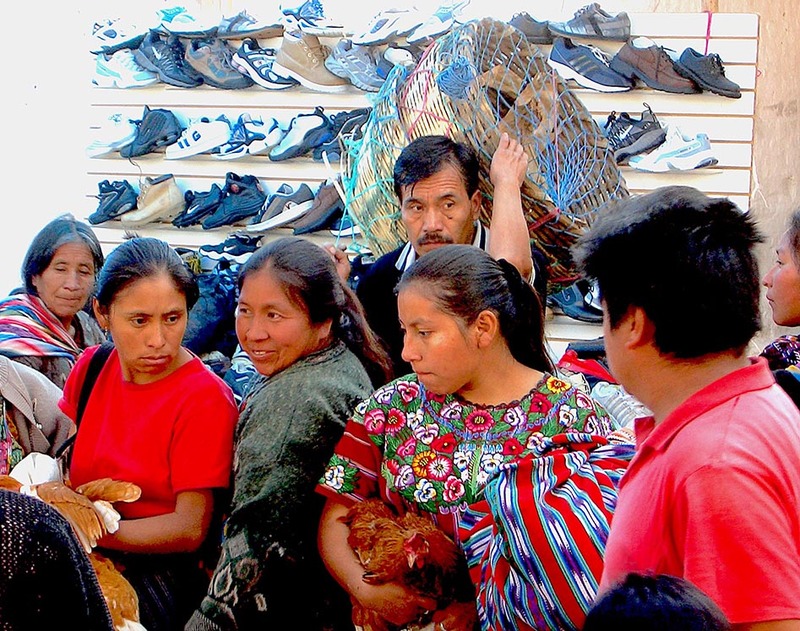 We arrive into the Chichicastenango market early and it is already quite hectic. Both locals and bus loads of tourists mingle around the stalls. We are getting harassed by a lot of roaming sellers who either didn’t bother to setup a stall or are just mobile salespeople for their established stall. Selling everything from fridge magnets, blankets, rugs and wooden masks. We hit the fresh produce section. Meat hanging on hooks in the open air, live chickens being squeezed by would be buyers to determine their plumpness. Grains are being sifted for impurities and displayed scattered across large rugs. Flower sellers competed aesthetically with fruit and vegetable stalls given the vibrant colour of the produce in this very tropical region of the world. Exploring the live produce market in Chichicastenango. While we were literally in the market for a genuine Guatemalan rug we were trying to look disinterested while looking surreptitiously at the rugs laid out in many stalls we passed. Our staged disinterest merely to dissuade the sellers from following us like we were the pied piper through the market stalls. Having passed the chosen stall 3 or 4 times Allison was now keen to make a purchase. She was just trying to find a nice seller she could have a decent conversation with. After a few hesitant enquiries she got down to business. My casual suggestion was a large rug may not be the the most practical item to add to our already overladen backpacks when we still have some months travelling to go. This of course fell on deaf ears. I admit though it was a bit better than the large ceramic candles holders that I managed to avoid a few months back in Mexico! So I’m glad to say a king sized rug was purchased at a reasonable price and despite it adding a few kilos to the load it has served us very well in the years that followed. I often think back to the young boys assembling the stalls in Chichicastenango. While this article is dated 2005 it was published here more than 10 years later. These 10 year olds would be over 20 and may even have children of their own. Perhaps they are already training them up to assemble their own stall. It could also be a very different outcome for these youths with Guatemala a beautiful but dangerous place with not much support for children should they fall through the cracks. Misión México, a refuge for children is based just north of Chichicastenango in the Mexican region of Chiapas. It houses orphaned and abused children who have no place else to go. Established by an Australian couple Pam and Alan Skuse it has been operating since 2001. I came across their story while devouring a burrito in a Guzman Y Gomez restaurant in Bondi as GYG are a major sponsor. While I’ve not yet been to Misión México yet, I do what I can to help with supporting their website to share their story. I encourage you to check it out and at least watch their inspiring movie ‘Somewhere near Tapachula’.